We catch up with Gentiana in her last week of preparation before her big opening day on Saturday 28th November. In Part 2 of a 3 part blog series, Gentiana shares why she chose to franchise with Rush, training and recruiting her team and how her salon design came together. Hi Gentiana, what made you choose to franchise with Rush? How is the franchising process? GENTIANA: It was the support that attracted me to Rush. I’ve had such close communication between the whole team especially the Chairman, the Operations Director and the CFO. I’ve been able to ask lots of questions and they’ve all been very helpful and patient with me. The process has been good, I thought it would be quite scary and I would feel like I’m doing it all alone, but not at all! What training have you had and how have you recruited your new team? GENTIANA: So much, it’s been amazing. 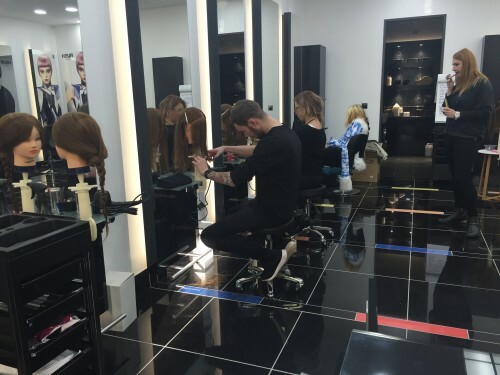 I’ve had stylist training to perfect my skills as a hairdresser at the Rush Academy. I’ve also had general management training from the recruitment team on areas like interviewing techniques and managing a team – everything has been so thorough right from the start. Rush have helped me recruit my team, all my stylists are from the Rush Academy and they are all are trained to a high industry level. My sister has been my support network and will be working as the Front of House. She was put in to manage another Rush salon for 2 weeks to prepare her for the role, so we both feel very prepared for Rush Cambridge! Tell us about your salon – how was the fit and interior design process? GENTIANA: Honestly I haven’t had much to do with it, I wanted it to be sleek and modern and it is typically Rush – beautiful and sparkly with high shine black tiles and lots of bright lights. I like the look and had full confidence leaving it to the team to put it together, it was a weight off my shoulders! GENTIANA: I would strongly advice people thinking of owning their own salon to franchise over than go independently. You have the backing of a great brand, you have so much help and support from all the different departments and all your customers know you and what your brand is about. I’m so excited to start my salon in Cambridge! Read about Gentiana’s opening in Part 3 of Coming to Cambridge.